***** DISH OF THE WEEK (Sunday-5/27/18-Sam’s Pizza). If you’re looking for a New York Style Pizza- Sam’s Pizza makes the real deal! By the way, Sam’s does slices- a plain cheese slice is gonna run you $1.95 (add $.50 per topping). ***** Sam’s Pizza, 928 Belvedere Road, West Palm Beach, Florida (561) 835-1394. Got a real good hole in the wall pizza joint for you guys to checkout- Sam’s Pizza in West Palm Beach. Real simple concept at work here- order/pickup at counter, 2 tables and a handful of counter seats, open Sunday-Thursday 11am-10pm, Friday-Saturday 10am-11pm. 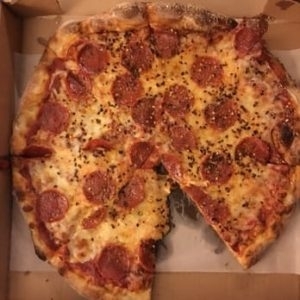 Last night, Jeff Eats and Mrs. Jeff Eats did a large (16”) pepperoni pizza at Sam’s Pizza- and I gotta tell you that it was right on the money. I don’t know about you guys, but Jeff Eats and Mrs. Jeff Eats like thin/crispy/sweet sauce/gooey cheese pizza- and Sam’s pie fit the bill perfectly! Just so you guys know, Jeff Eats and Mrs. Jeff Eats only did a large pepperoni pie! That said, based on that-delicious pizza and the great looking chicken parm sub and calzone- the guy next to us was wolfing down- Jeff Eats is gonna make a gut call here and bet that the rest of Sam’s Pizza’s stuff is also real good! 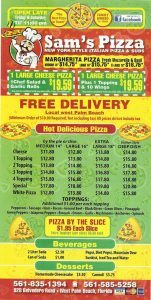 For menu/prices/info on Sam’s Pizza you guys can check- samspizzadelivery.com.